The White House was on lockdown for a while Thursday, Thanksgiving, November 26, 2015, after a white man wearing an American flag jumped its newly upgraded fence while President Barack Obama and his family were inside the residence for the holiday. Joseph is from Ioseph, the Latin form of Greek Ιωσηφ (Ioseph), which was from the Hebrew name יוֹסֵף (Yosef) meaning "he will add." In the Old Testament, Joseph is the eleventh son of Jacob. Caputo is a common Italian surname, especially found in the South, in the area of Campania. It derives from the Latin root of caput, meaning "head." It therefore can be a Southern Italian nickname meaning "stubborn'," "obstinate," thus literally for "someone with a large head." The fence lines along the north and south lawns remained closed late Thursday afternoon. 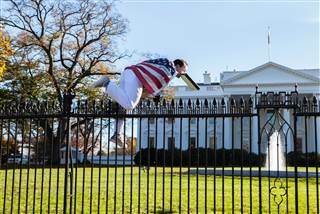 Fencing around the White House was bolstered with a new topping of sharp metal spikes beginning in June after an Army veteran pleaded guilty to scaling a White House fence with a folding knife in 2014. In an update, a sheriff's deputy shot and killed Curtis Smith of Coatesville, Pennsylvania, after he slashed a guard at the Chester County Courthouse the morning of Tuesday, August 25, 2015. Smith is the man who investigators say once jumped a fence at the White House. Curtis Smith, 33, of Coatesville, allegedly climbed over the outer perimeter stone wall of the White House at 15th and E Street NW Sunday, March 1, 2015, around 1:45 p.m. He was immediately arrested and taken into custody by Secret Service Uniformed Division Officers. Ian Boone, 40, of Cambridge, Ontario and Michael Fogg, 27, of Newport News, Virginia, were also charged in two other White House security breaches during the same window as Smith's incident. Boone allegedly climbed over the bike rack at the outer perimeter near 15th and E Street, NW around 11:30 p.m. Sunday, March 1, 2015, before being detained by Uniformed Division Officers. Fogg allegedly entered a pedestrian gate to the White House after a construction worker exited near East Executive and Pennsylvania avenues, NW around 6:45 a.m. Monday, March 2, 2015. He was also detained by Uniformed Division Officers. See also 1, 2, 3, and 4. Politics or parcour? A do-able dare,for sure. The spikes just make it hotter.